This vintage Valentine’s image was originally used as a page spacer to add some interest and white space between book chapters. 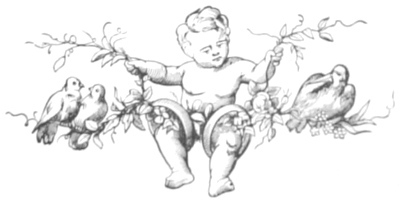 With a Cupid – like cherub sitting in a pair of wedding rings on a branch with a pair of love birds (or perhaps doves), it seems like this drawing from over 130 years ago would be great for a Valentine’s Day card or other holiday project. It was included in the book Ballads of Beauty which was published in 1878. Maybe it’s just me but the drawing does seem a little weird. Cupid looks a bit like he is swinging on a swing and yet the pair of birds sit on one side of the branch and a larger bird with a pointed beak is sitting on the other. I wonder if the larger bird is supposed to be a stork; as in the stork who brings babies to happy couples. He’s a bit small for that but the beak is right. Anyway, this drawing of Cupid with birds and rings is certainly something that could lead to interesting conversations.